Happy Saturday! 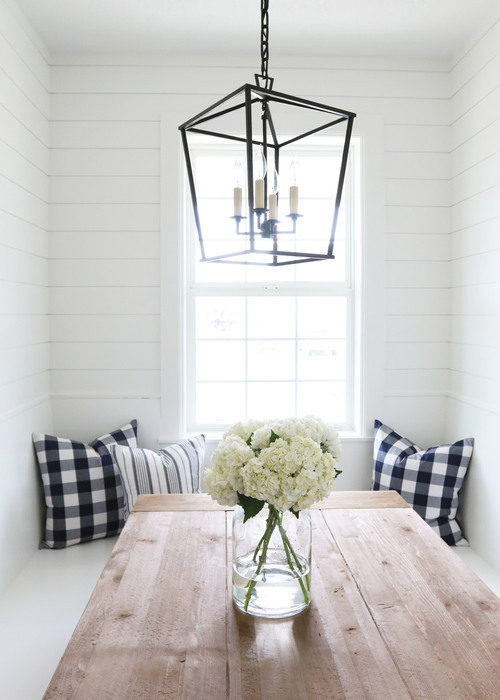 Today I am sharing the one accessory every house needs. Like if you only bought one thing to decorate your home, let it be this. 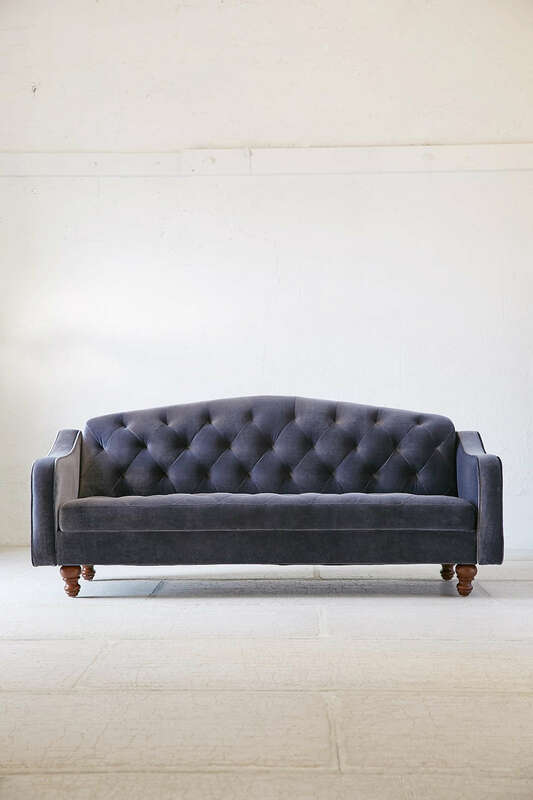 It is the perfect size, perfect shape, and it is vintage too, which makes it all the better (if that is even possible!). And now, here is proof (in ten pics!) 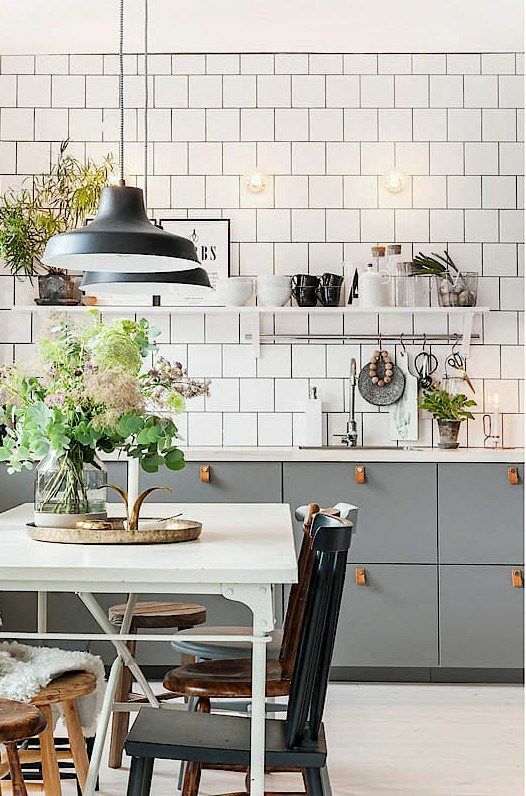 showing how much this one little accessory can add to a space. And you don't have to splurge on stuff to fill it! Get your clippers out and go trim something in your backyard! 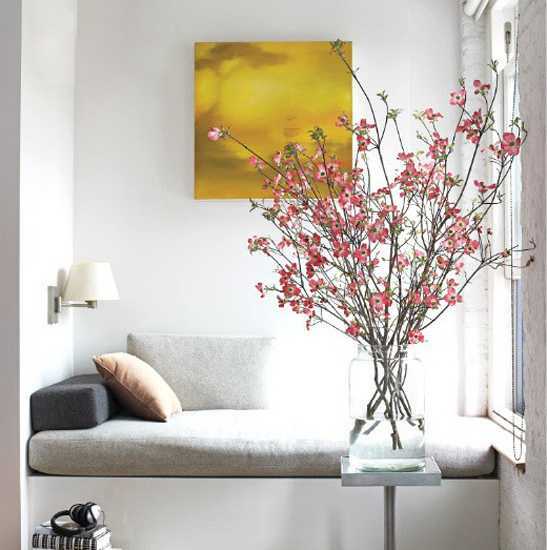 You will be surprised how some simple leafy branches can add so much to your space. 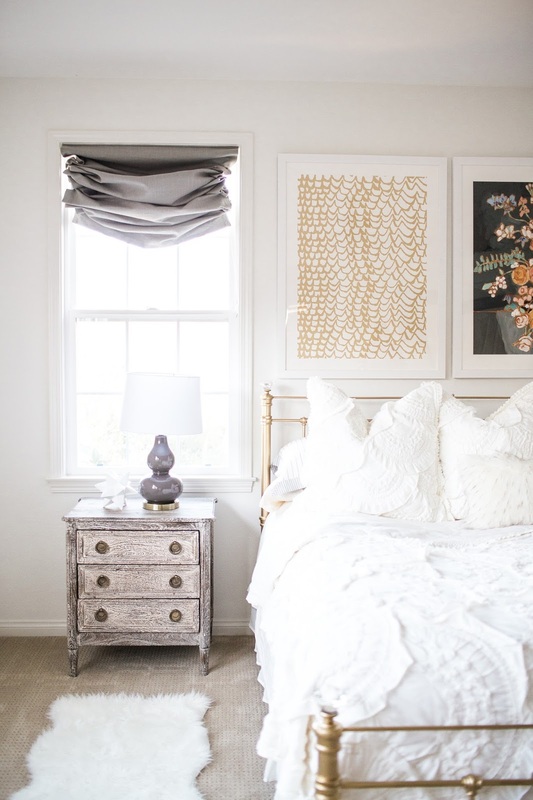 I have had the opportunity to work on a few different e-design projects for Corrine of the blog Mint Arrow and, today, I am excited to be sharing the pictures from her master bedroom that was recently completed. 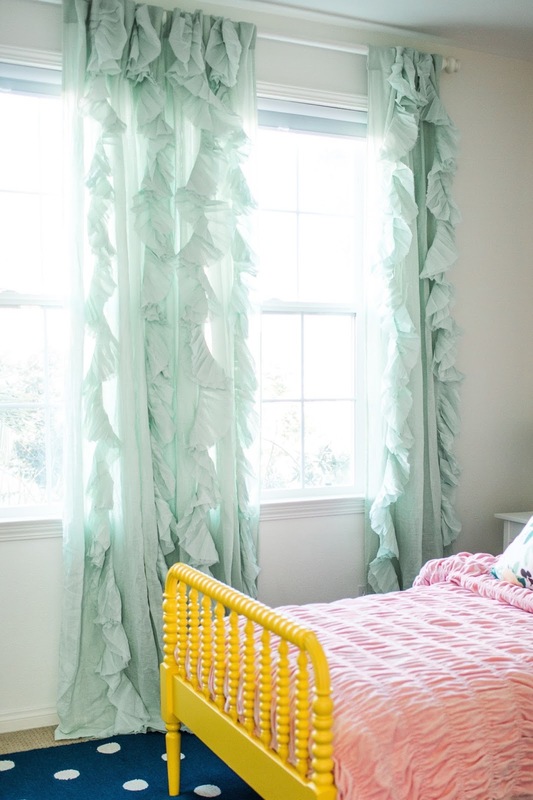 Corrine had fallen in love with this beautiful bedding from Anthropologie (you can read why she loves it here and here) so that became the jumping off point for the design of the room. 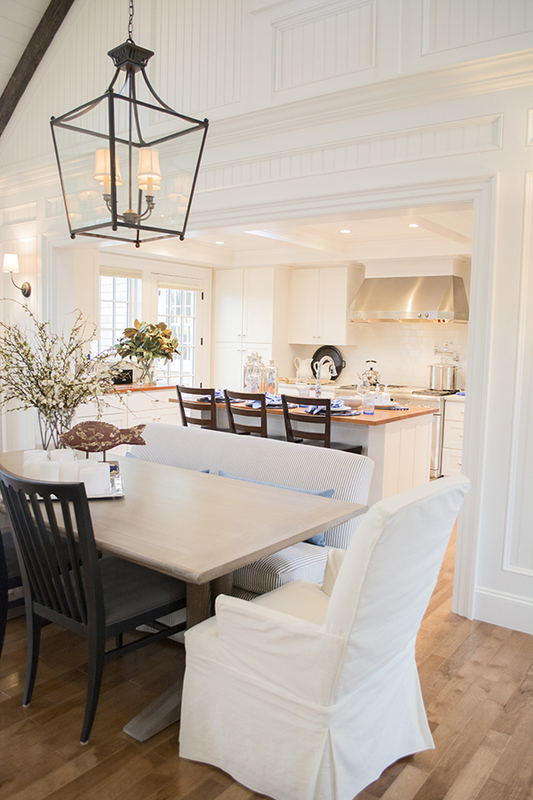 She had also recently painted her whole home white so we knew we wanted to keep the space light, open and airy feeling. 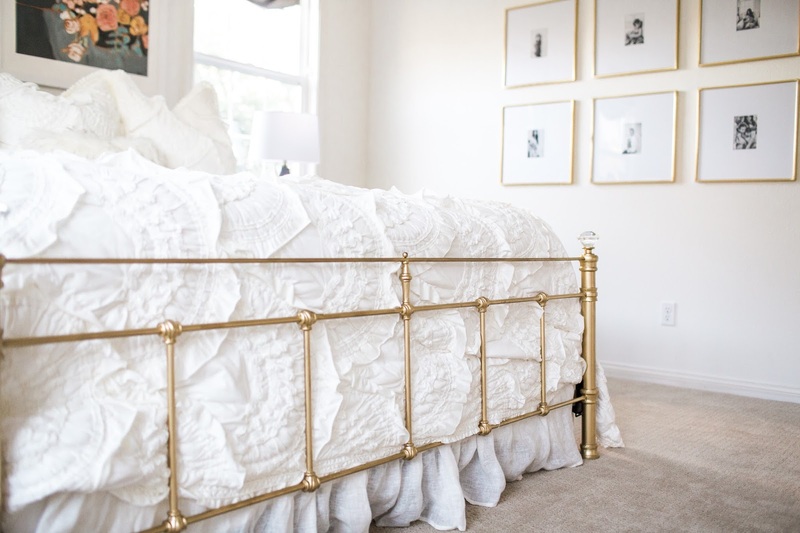 We kept her metal bed frame, but spray painted the black, iron finish a bright, matte gold with this spray paint, lightening up the bed and giving it a fresh look. 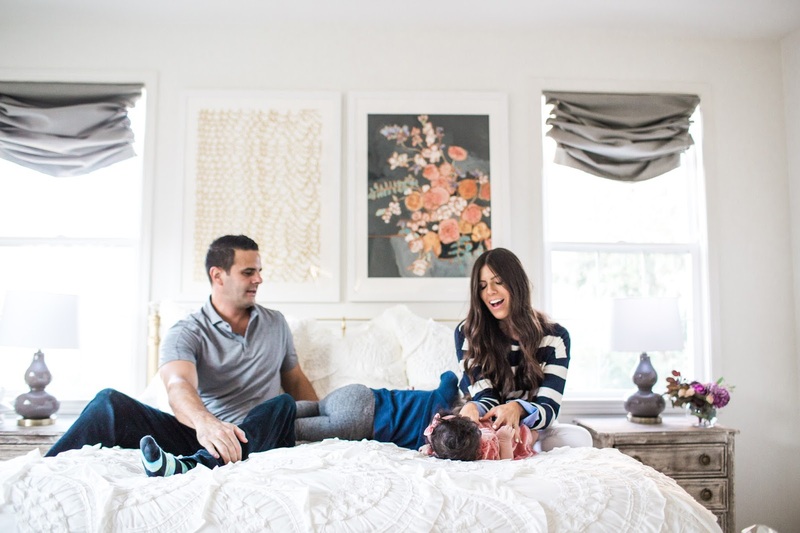 The gold picture frames come together for a gallery wall of family photos that was the perfect way to style that large wall that we didn't necessarily want furniture on. 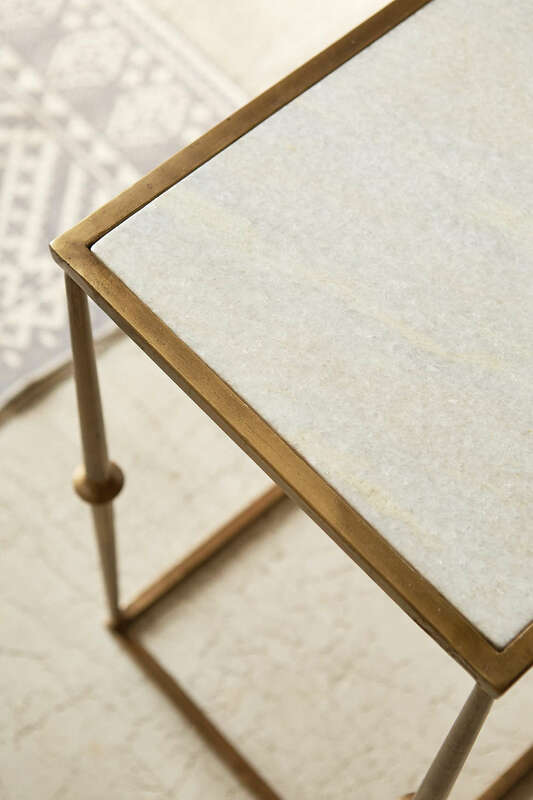 The nightstands have a beautiful weathered finish that helps to balance all the gold finishes in the room. 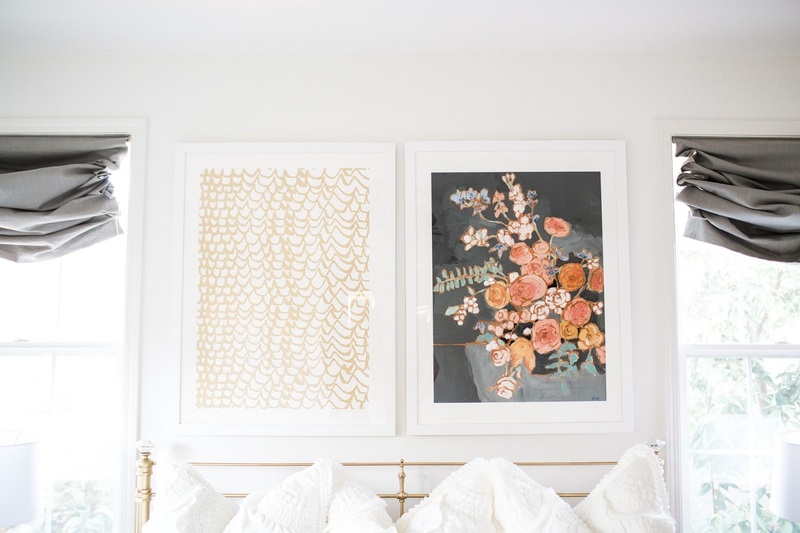 The artwork complements the bedding, adding a little color to the space, and also helps to create a focal point given that the headboard of the bed is more low profile. 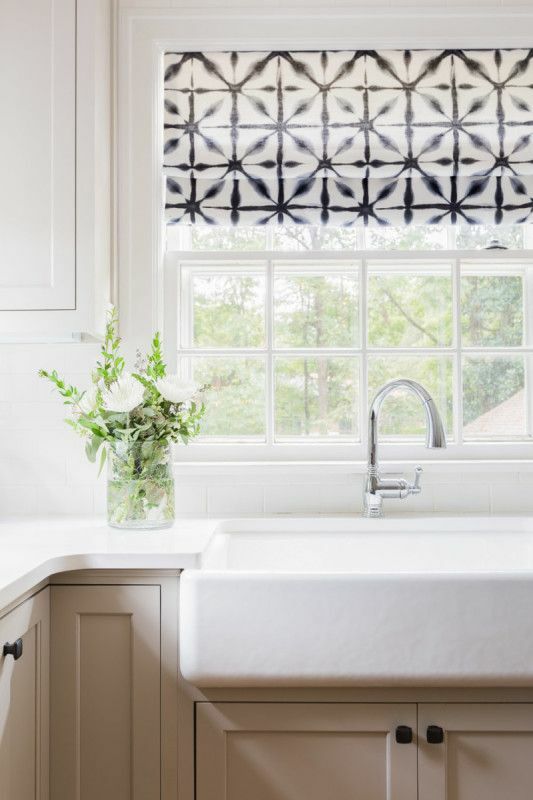 The roman shades were custom made in a charcoal grey linen that contrasts beautifully with the clean, white walls. 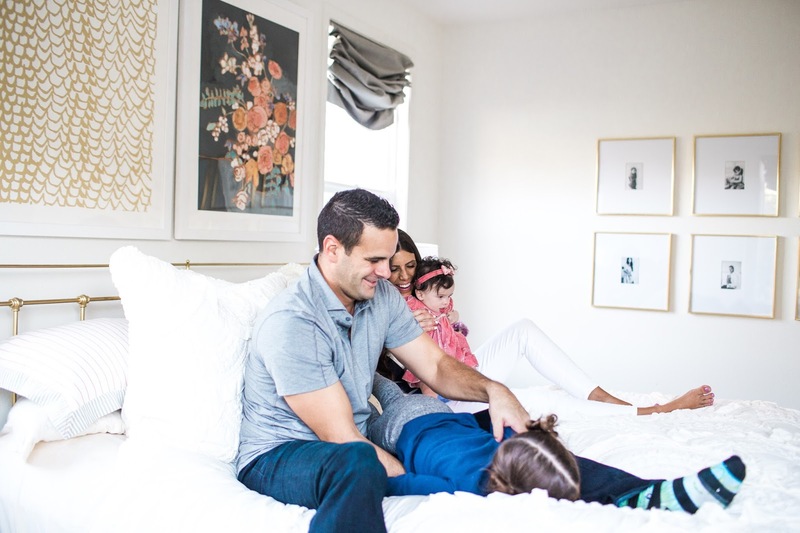 It was such a fun project to do for this beautiful family! *Out of respect for clients, I do not share sources from e-design projects. However, you can check out Corrine's post about this room here for sources she is willing to share. Thanks for understanding! For more information on e-design please check out this page. I am currently booking clients for April and May and would love to hear from you! 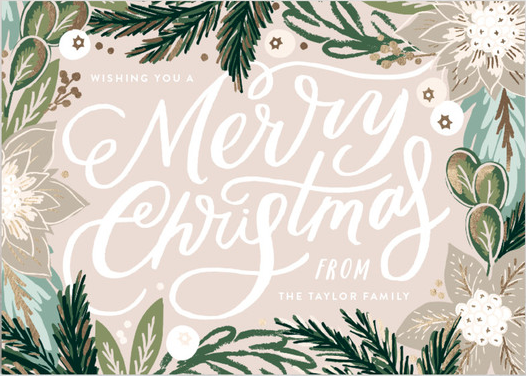 Today, I am so excited to share the pictures from an e-design project that I had the opportunity to do earlier this year for my sweet friend Corrine of the blog Mint Arrow. She runs a super fab high-end deal blog and is one of the sweetest people you could ever meet. 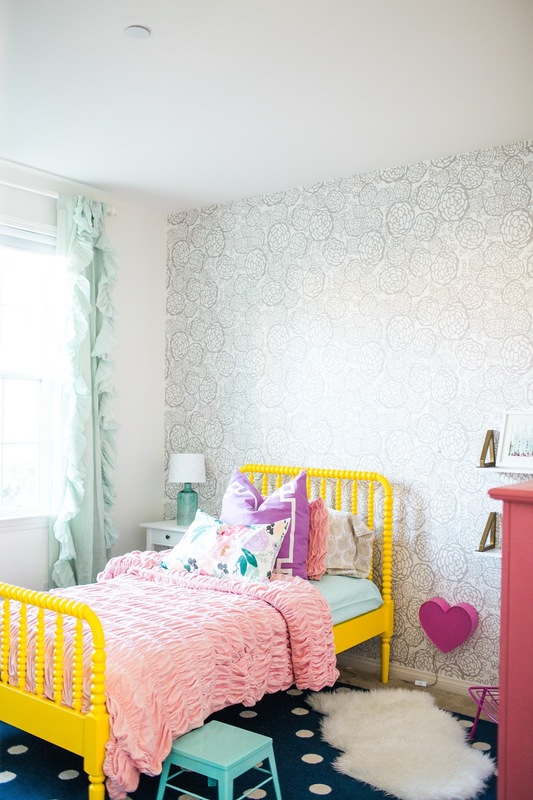 The project was for her little girl, Ani, and the goal was to make the room bright, fun and happy. 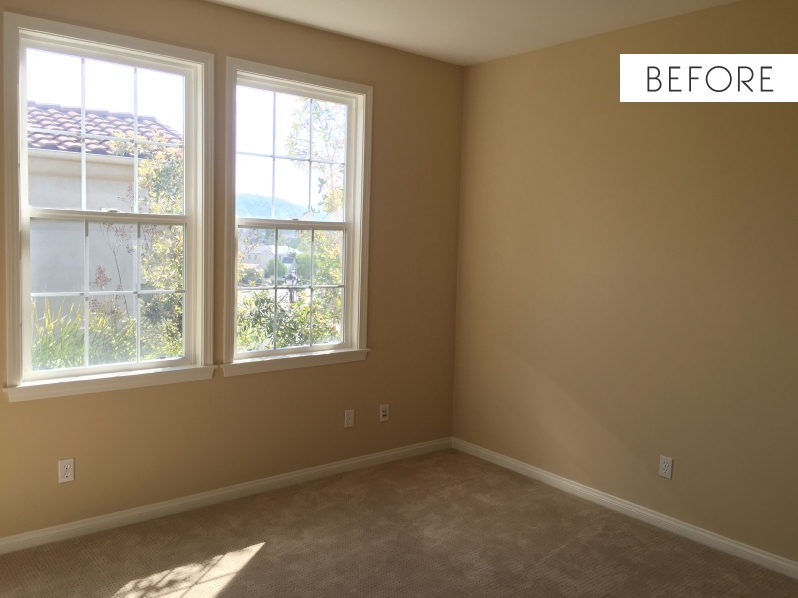 Corrine had recently repainted all of the walls white which helped brighten up the room immediately. 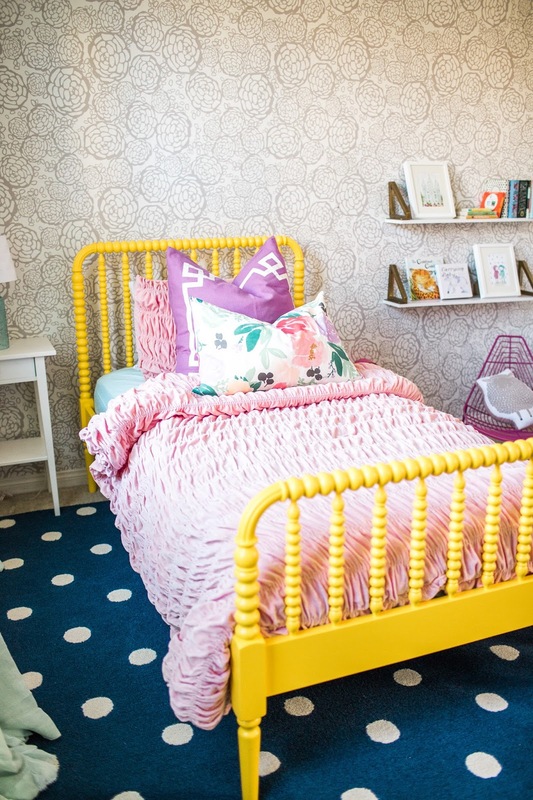 I knew the yellow bed would be the perfect piece to design the room around. 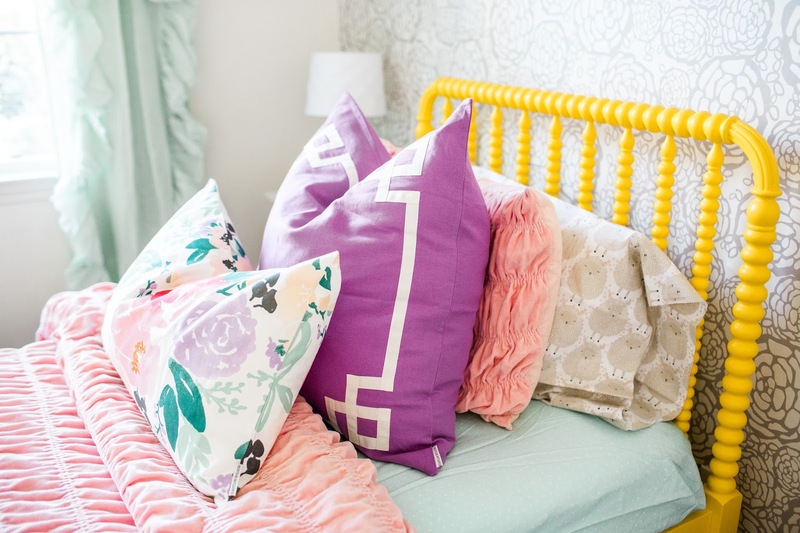 The color palette of various shades of pink, mint and purple keep the room fun and happy and the floral pillow ties everything together. 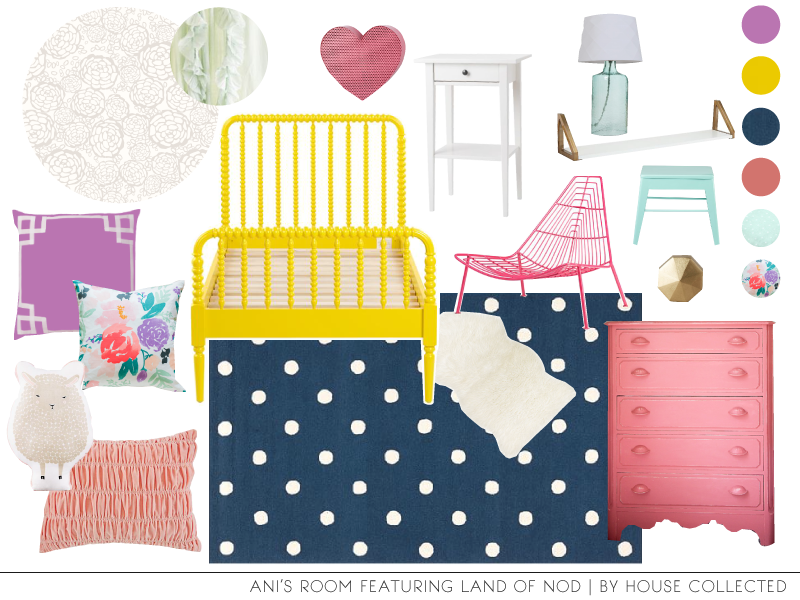 The navy polka dot rug grounds the space and allows for variance in scale and pattern. 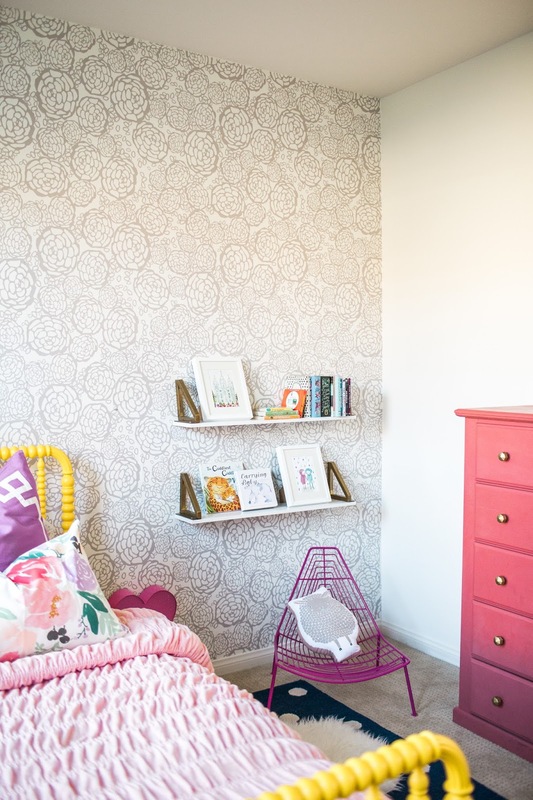 The wallpaper allows the room to have a focal point without having too much competing for your attention on the wall behind the bed. Corrine and her husband repainted a dresser they currently had in chalk paint and we added brass hardware to tie in the brass on the shelves from Ani's reading nook. 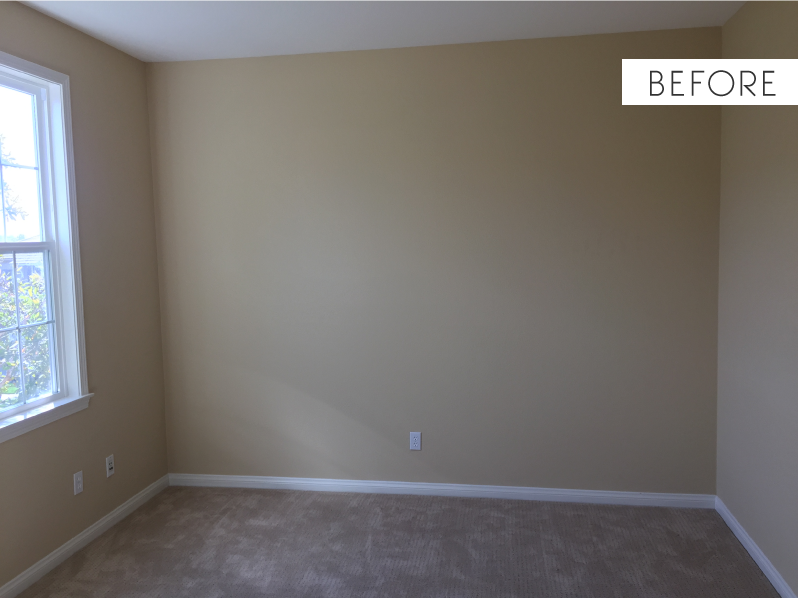 Below is the concept board for the room as well as the before and after pictures. 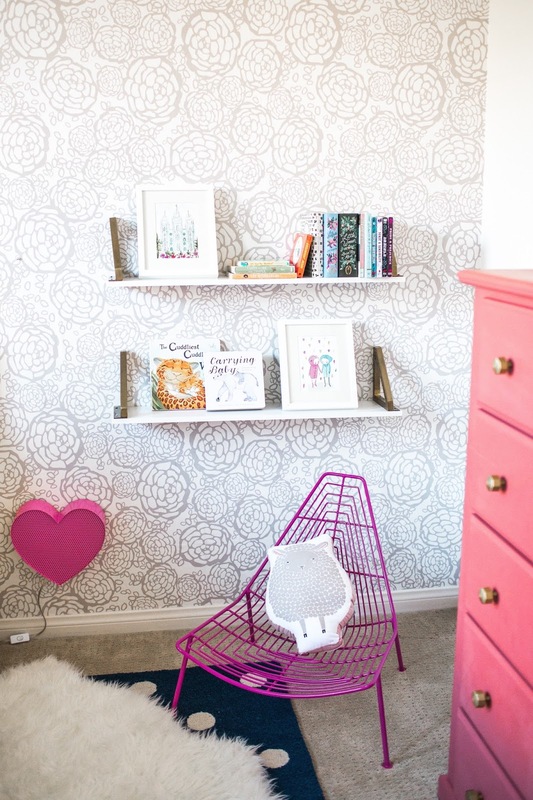 It was such a fun project to do and everything came together to create a bright, fun and happy room that will grow with Ani as she does. I am currently booking clients for January and February and would love to hear from you! 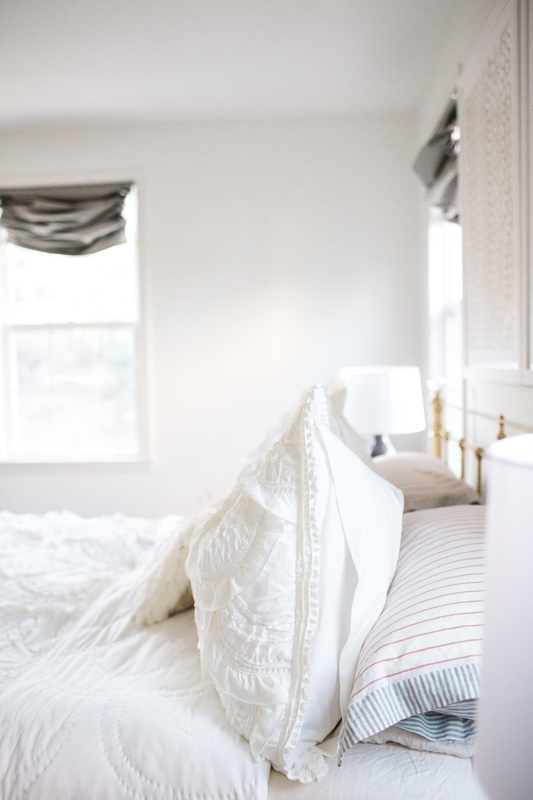 Also, there is nothing better than crisp, all white bedding. It is my go-to for just about every bedroom. You can mix up the look of it with pillows and throws, but the basics stay timeless and classic. 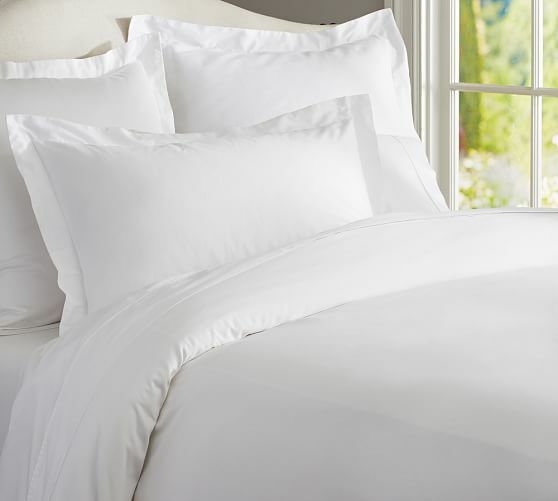 You can get this white duvet cover today in a Twin for $44, Queen for $59, or King for $74 with the code DREAM. 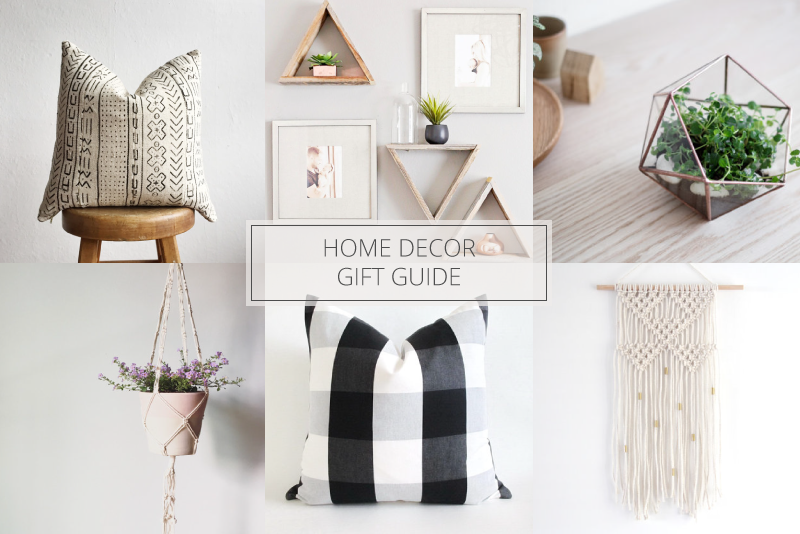 I can't believe it but there is only a little less than six weeks left until Christmas and if you have someone on your list that has an affection for home decor, this post is for you! Six, on trend, home decor gift ideas...all from Etsy, supporting creative small businesses, and all under $55! 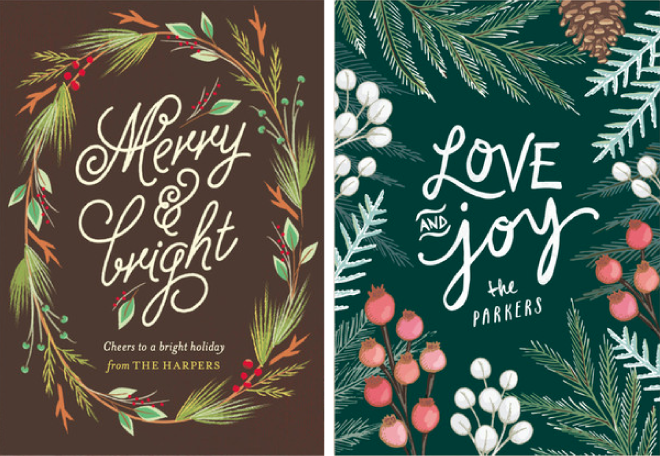 And if you need a little more holiday gift inspiration, you can check out Etsy's holiday gift hub here. I have this thing for florals... Floral paintings (I secretly wish I was Anna Rifle Bond or Lulie Wallace), floral prints on dishes, floral fabrics, floral everything...and so it was no surprise that when I went to select my Christmas card for this year, that I was drawn to all the floral ones. 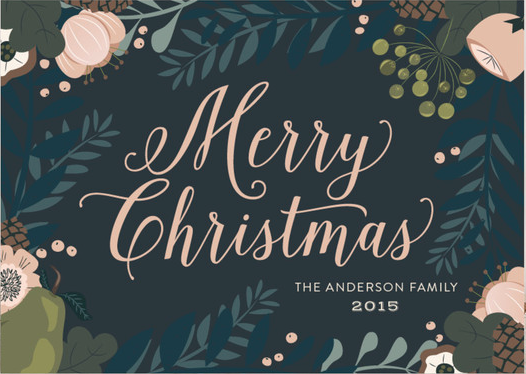 I had the hardest time deciding (SO many fab options from Minted this year! ), but I ultimately decided on this one in the green color. 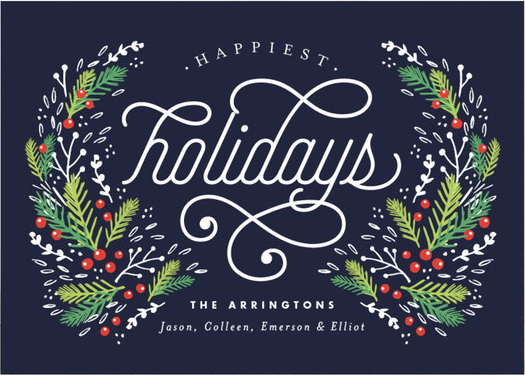 We didn't have family photos taken this year, so I also love that they offer 'Non-Photo' cards and that the front isn't primarily a photo. I am super excited to send them out! Here are all of the ones that I had a hard time deciding between. I love the different color combos. 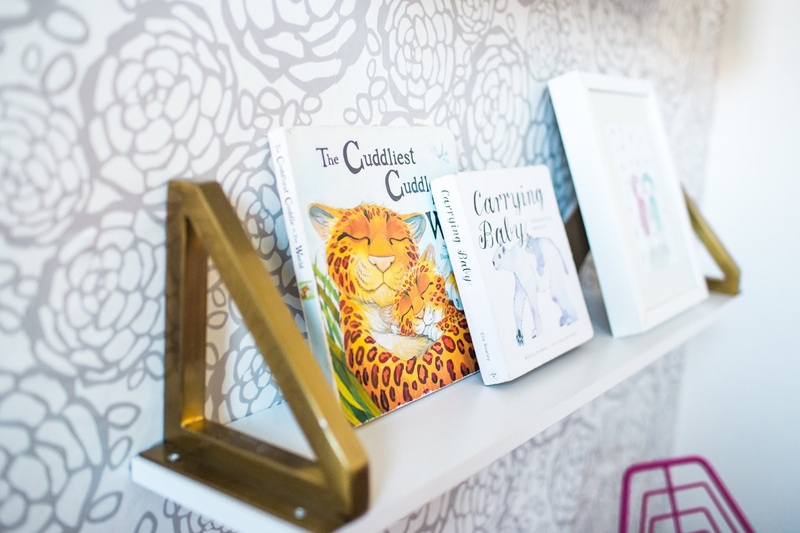 Also, on a completely different note, because if you read my blog you probably have an interest in house stuff, did you know that Minted just came out with custom house portrait art? I am dying over these! I mean line drawings of houses + fab colors + LETTERPRESS! I think I would even smile at a bill if it came in letterpress haha. Anyways, check it out if you are looking for a unique and special Christmas gift this year! 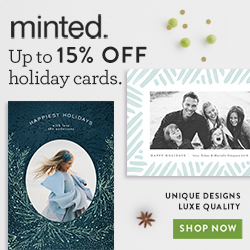 *Thank you Minted for partnering on this post. It may be early to be thinking about Christmas, but I am one of those people that put my tree up super early (I may or may not have put it up on Halloween night before...ahhh, I know...that is even early by my standards!) BUT stores put out their Christmas decor in late October so if you are looking to purchase some new holiday decor, now is the time to be thinking about it. I tend to love the look and smell of a simple fresh wreath (more on that below on my favorite source for those), but real/preserved ones are the next best thing in my opinion. I searched numerous places and these are THE BEST. 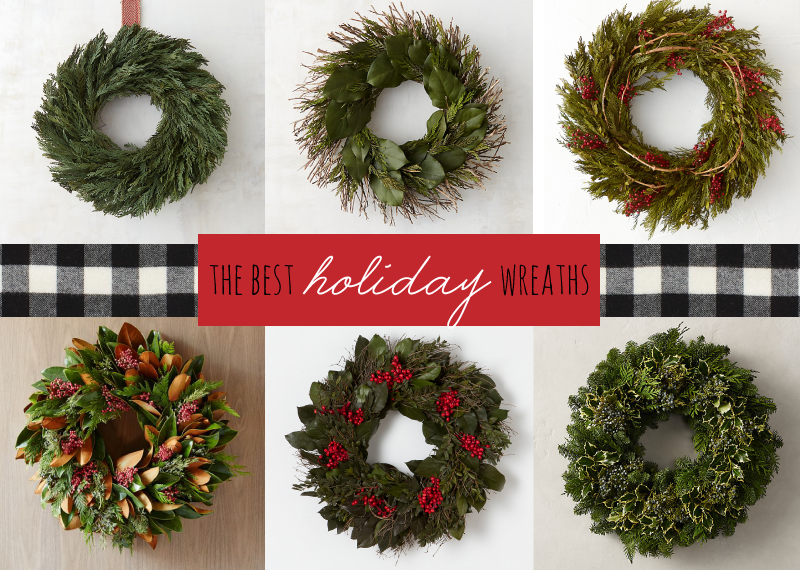 Now, for the best place to get fresh wreaths (and garlands! ).....Trader Joe's! Even less expensive than Costco, friends! Let's be real though, what is Trader Joe's not the best for?! I could write a whole other post on that. The one thing about the fresh stuff is that it doesn't hit stores until the first week in December and so that doesn't always work with my eager to decorate ambitions, haha. Number three is my personal favorite and I've also got my eye on these stockings (I mean buffalo check! ), this garland, and these advent calendars here and here. 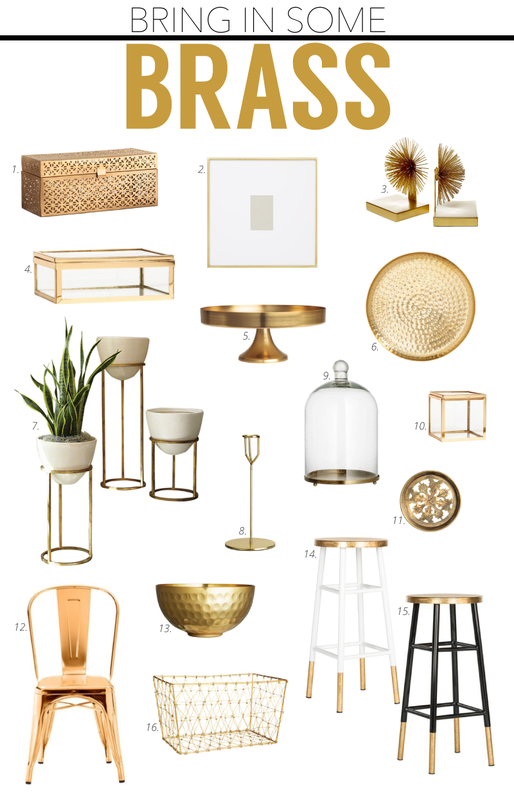 Today, I am sharing my favorite inexpensive ways you can update your space by adding a little brass. 1. On a shelf, nightstand, or your cocktail table to hide your remote controls. 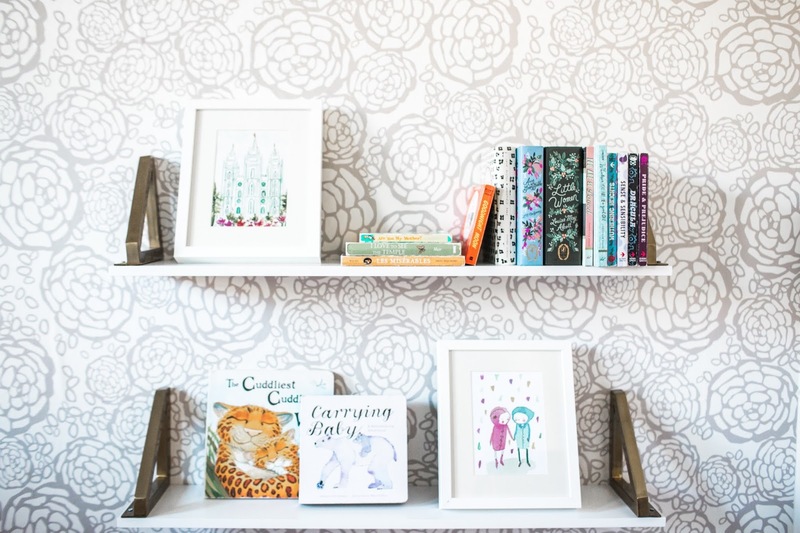 If you use it in a bookcase, add 2, 3, or 4 on different shelves to coordinate the look. 2. 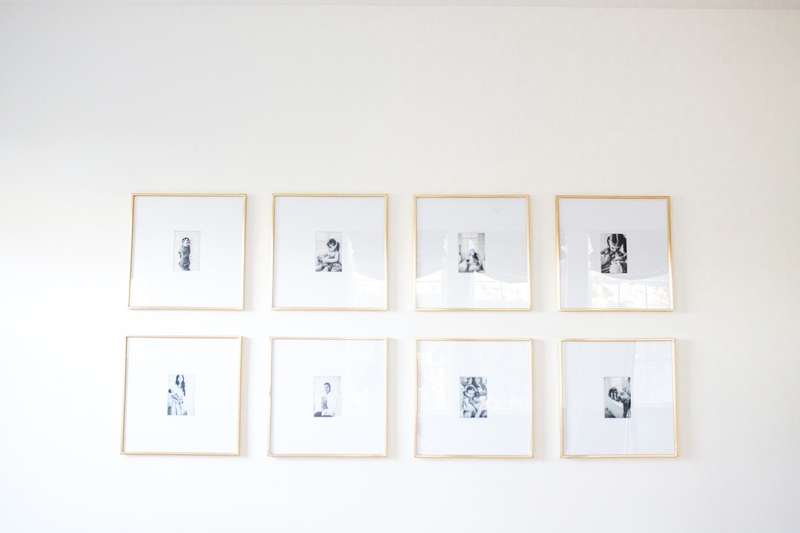 Use it in a bookcase, stack three in a powder bath, or group nine for an impact on a large wall. 3. Display your favorite books on a shelf or console. 4. Stack it on two books on a shelf for layered interest and display seashells from your last trip, or other small objects you love. This one is a great price and these ones are great too if you want lined ones. 5. Group fruit, display a cake or muffins, or use it to group oils and vinegars in your kitchen. 6. On a cocktail table to group smaller items. 8. Group two on a console or sideboard. Use a book or two underneath one of them to stagger the heights a bit. 9. 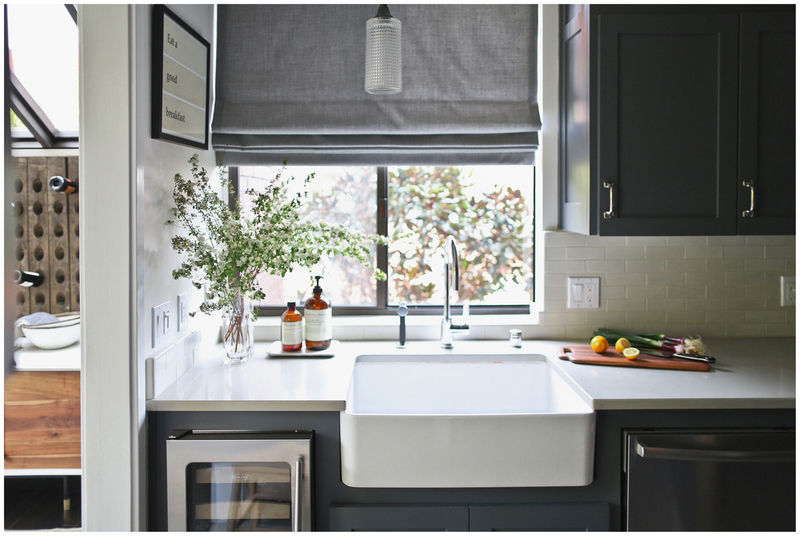 In your kitchen, on a bar cart, or use it on a sideboard in your dining room. 10. Stack it on 4 on a shelf or layer it on top of 5 on your bathroom counter. Put your rings in the small box and group it with your perfumes on the cake stand for a layered look. 11. You can use these fabulous coasters anywhere you want to protect your furniture. 12. Use one up to a desk or multiple as dining chairs. 13. Group lemons or limes in your kitchen or on a bar cart. 14. & 15. 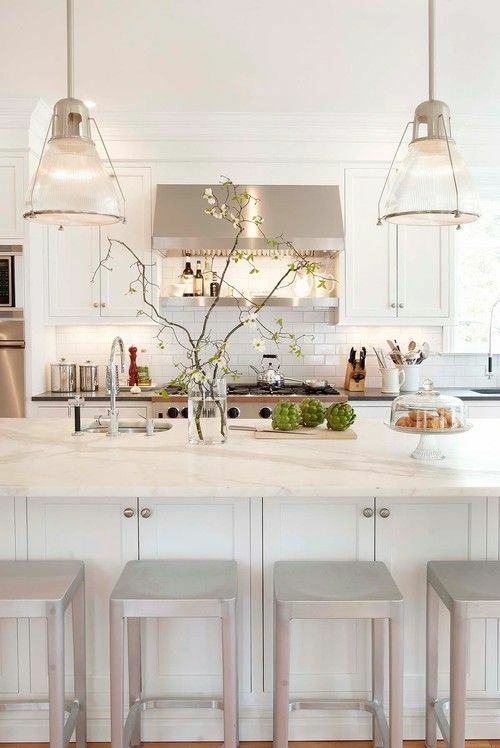 Barstools! 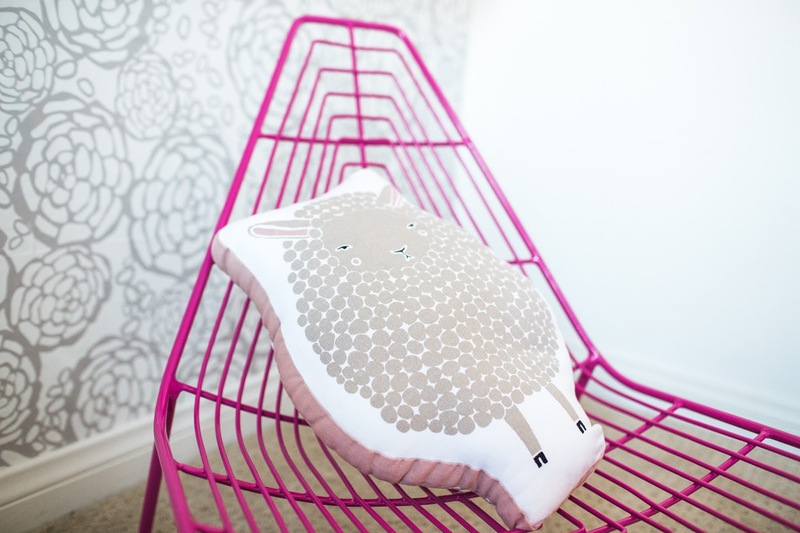 And how easy would it be to DIY these if you have the blah wood ones! 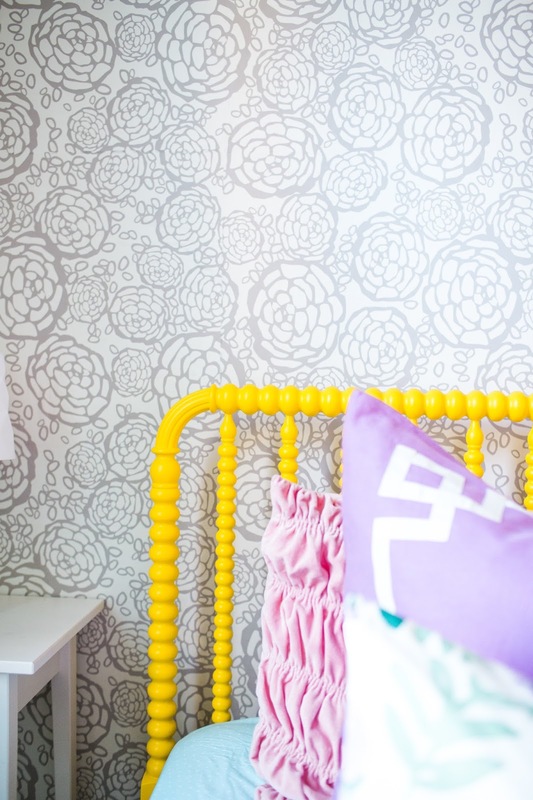 This is my very favorite gold spray paint if you want to tackle that project. 16. 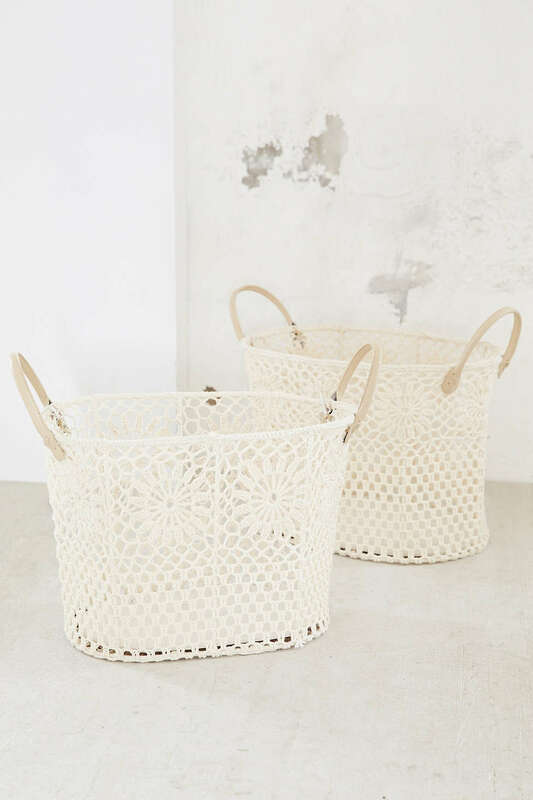 Anywhere you want to group something or organize with a pretty basket! 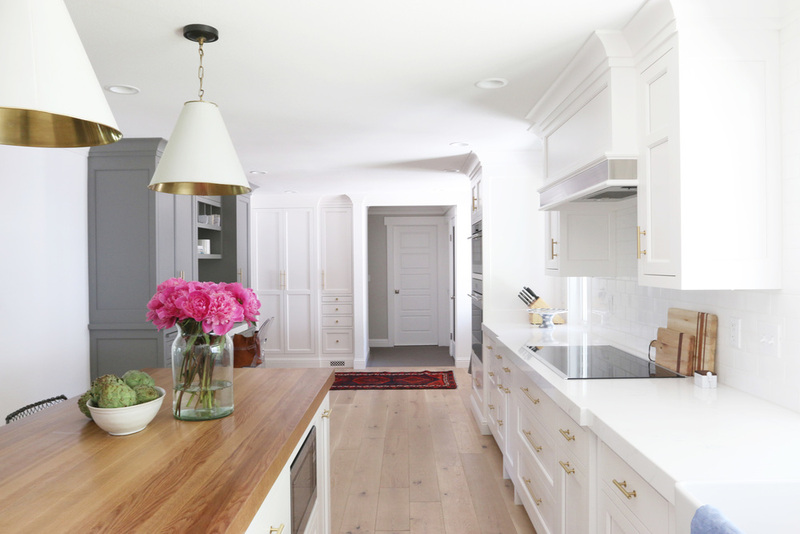 So, the one way you can make sure brass looks good in your space is to bring it in with a few different pieces. You can absolutely mix metals! 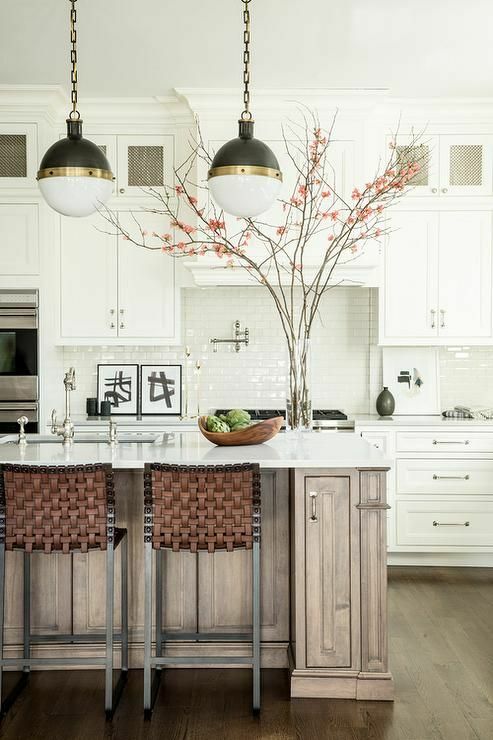 Don't be afraid to add some brass because you have nickel hardware or oil rubbed bronze light fixtures. 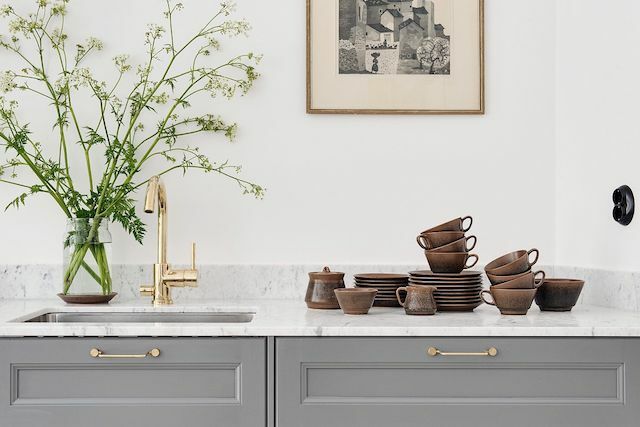 You just want to make sure your brass accents have a good presence by repeating that element with a few other brass pieces in your space.